An army of 200 mercenaries is on its way to highsec? That can only mean one thing: It's time for another edition of the Highsec Miner Grab Bag! Speaking of creatures we didn't know there were... Deer humpbacks? As long as you're a carebear who's going to make ineffectual threats, I guess you may as well make them weird and creepy like Addo of Nex. Ah, EVE-O. 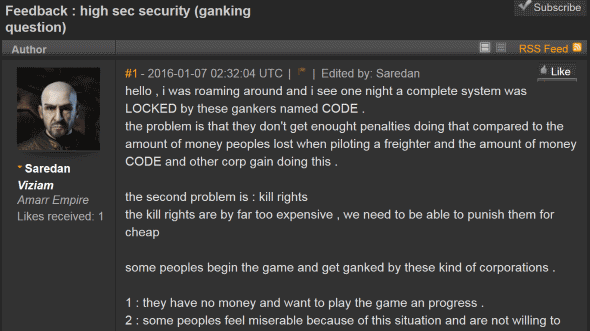 It's never long before a "ganking question" becomes a whine for additional nerfs based on concerns about player retention. Seriously though, it's the EVE-O forums that have the worst retention of all. You know you've done something wrong as a moderator when people are leaving the official forums in favor of Reddit. ...But leave it to our highly creative, content-generating Agents to come up with a good way to use a useless mechanic. 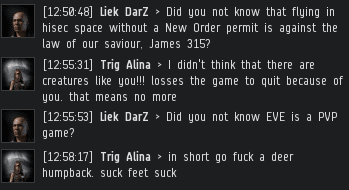 For some reason, a lot of carebears claim to be war veterans, often at the very moment they run screaming from highsec PvP (or harmless bounties). Many of them are lying, of course. But it occurs to me that a good military policy would be to filter potential recruits based on their EVE careers. Bring in more PvP'ers and restrict the PvE crowd. Promote Code enforcers to the highest ranks. Result: world peace achieved in no time. There's no rant like a paranoid rant. Nice to hear about the progress in the Help channel, though. 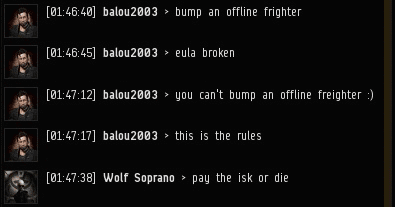 balou2003's freighter alt was being bumped. The solution? Fraps and space lawyering. 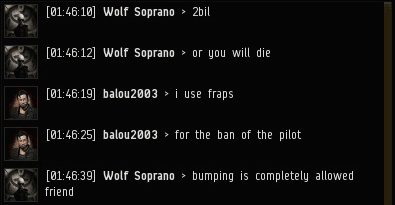 Space lawyers come up with the wildest ideas. I'd say they're creative, but it usually boils down to "whatever you're doing to me right now is against the rules." 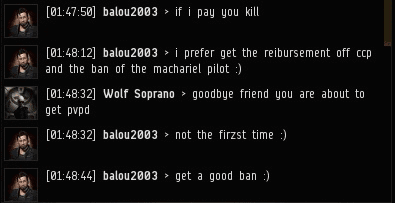 Sorry, carebears, but at this point I probably reimburse more ships than CCP does. Blackmailing CODE. is never worth your time. Transparency, remember? Literally a bot-aspirant. What a shame. There are few bad ideas that can't be fixed with an open mind and a fresh link to MinerBumping.com! Bot Aspirancy is failing daily. Thank James 315 for creating the army brave enough to stand in the way of true bot aspirations of miners. lol tinyminer! Paying someone to create a program to play your game for you! The audacity of some people! We're approaching the big 100th grab bag! "Ah, EVE-O. It's never long before a "ganking question" becomes a whine for additional nerfs based on concerns about player retention. Seriously though, it's the EVE-O forums that have the worst retention of all. You know you've done something wrong as a moderator when people are leaving the official forums in favor of Reddit." 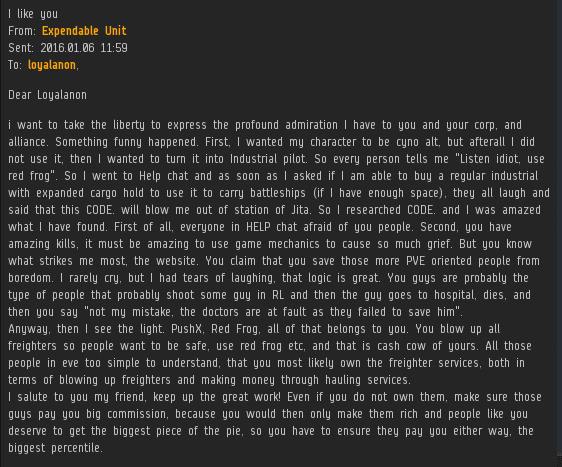 "Sorry, carebears, but at this point I probably reimburse more ships than CCP does."